Our early flight to Auckland was slightly delayed but not by much. We had a few hours layover in the city before our flight to Santiago in the evening so thought it best to get out of the airport and do some sight seeing. We hadn’t seen any of the city at the start of our trip so these few ours were ideal. We hoped our bags would be checked all the way through from Christchurch to Santiago but alas they weren’t. We arrived at the domestic terminal, collected our bags and walked to the international 15 minutes away. Next step was to try an early check in, but again no luck. Our tickets said we were flying Qantas but in fact we were flying Latam but there desk didn’t open for hours. So we paid to store our luggage and got a taxi bus into town. Already the few hours in Auckland were costing quite a bit. Auckland airport is a 45 minute drive so not that close to the city centre. We were dropped off on the main shopping street and first headed to the Sky Tower. It’s the main one you see every New Year’s Eve that they do the fire works from. It dominates the skyline at 328m tall and is clearly the tallest building. Mike wasn’t a fan of the glass elevator as we arrived on the 51st floor observation deck. The 360 degree view was stunning especially as it was a crystal clear day and the blue sky’s meant we could see for miles. The windows slope outwards so Mike stayed firmly in the centre while I walked around taking photos from every angle. We could see the Auckland harbour bridge and Waiheke island where we went wine tasting on our first day in New Zealand. Next we went up to the 60th floor the Sky Deck for slightly hire views. The windows here were straight so Mike felt a little more comfortable. We took photos and descended in the glass lift, which also had a glass floor which didn’t help Mike. Back on solid ground we had some lunch and moved on towards the parks. First was Albert Park in the centre. Up some steep steps and had a nice water fountain in the middle which gave some nice shots back at the city centre. From here we moved onto the Auckland Domain. A large park apparently on the slopes of an old volcano. Here we walked through the trees until we reached the War Memorial on the other side. 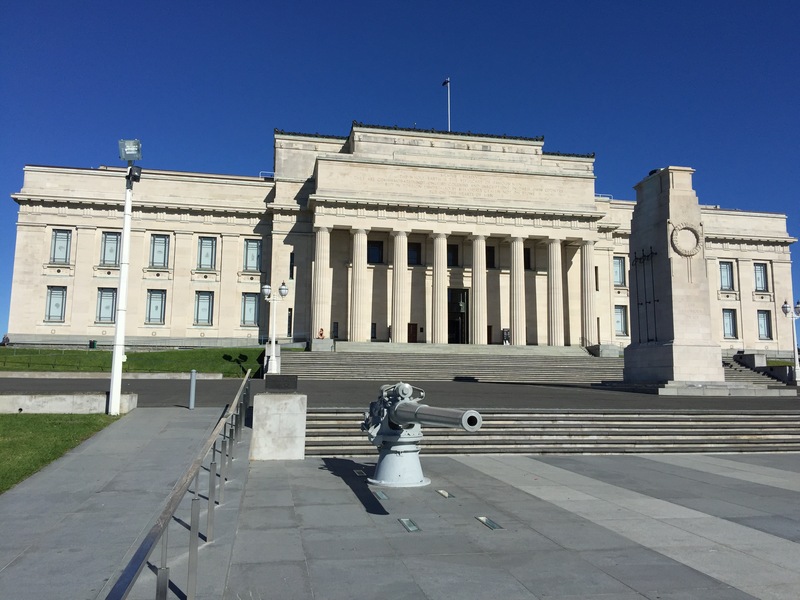 A water feature and cenotaph stood in front of the impressive museum. After taking photos Mike flew the drone and we relaxed in the sun before heading back to the airport. Our flight was on time and in a newish dream liner plane. We were flying 10 hours to Santiago for a quick sleep and then back 5 hours to Easter Island in the the middle of the Pacific. The strange thing was we would land before we had taken off as we were crossing the international date line. We took off at 6pm on the 2nd of May in Auckland and landed at 2pm on the 2nd of May in Santiago. I’m now not sure if I’m slightly older younger than I was! Now 2 continents down and onto our 3rd: South America. 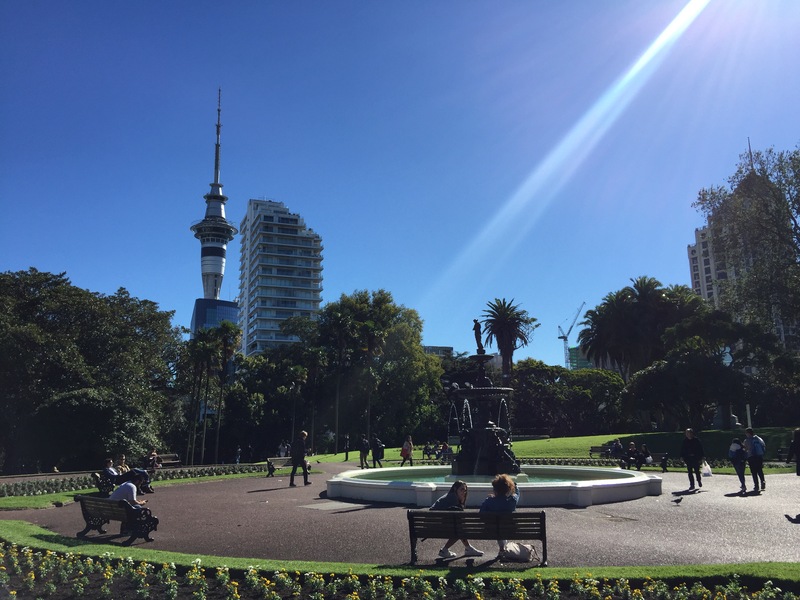 I am travelling to Auckland Next month and these inputs will be super useful! Thanks! !